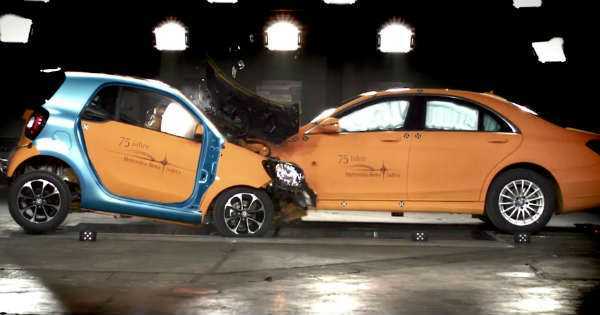 Crash Test: Mercedes Smart vs Mercedes S-Class! - Muscle Cars Zone! Crash Test: Mercedes Smart vs Mercedes S-Class! There are couples of things that are of utmost importance to you when purchasing a new vehicle. Those are comfort, price, power and most important of all, the safety of the vehicle. One should never compensate the safety of his car for power and speed. To satisfy all customers and to make them aware of how safe their cars are, Mercedes conducted an amazing test that might seem a bit unserious at the start. Namely, they decided to test out two completely different vehicles that are going to crash into one another. The first car they are going to use is the Mercedes S-Class, whereas the other one being significantly smaller, the Mercedes Smart. Even though it might seem like something impossible to compare, you are going to be amazed by the result. When everything seems set and ready for the test, both of the cars are speeding towards one another at a speed of 50km/h. Then, all of a sudden the crash takes place. Even though it might seem that the Mercedes Smart was absolutely wrecked, which in fact it, there is the Tridion cell in its core, which is something that helped this small car pass the safety test. The exterior of the car indeed is completely destroyed, but on the inside the car seems OK. What do you think, was this test enough to convince you in the safety of this car and would you ever buy one? Finally, follow this link to see the 22 crash tests which changed the way automobiles are made!